Previous post: is that all there is? When Alex woke me up this morning, I was certain, and not for the first time, that he was indeed smoking crack, as it couldn’t have been even 4:30 in the morning, nonetheless 8. Someone really ought to tell him he can go back to bed for a couple hours, I mused to myself, but determining this to be a too-depleting energy expense, I simple rolled over and pretended he wasn’t there. After all, if he simply fails to wake me up this morning – if it is simply not possible – he’ll eventually have to give up and I will be able to sleep uninterrupted, forever. I am nothing if not the height of rationality in the morning. Anyway, it didn’t work, I am sleepy and now here we are, aren’t we? Let’s step back to a more pleasant time, say, yesterday evening when this fatigue was incurred. It was a good cause, and I have no regrets, most importantly, none of the kitchen bounty variety. All of my obsessive prepping for the dinner for ten eight six, a sly excuse for what was really a chair-warming party, paid off. Even better, I cooked nothing I wouldn’t make again, thus breaking the cardinal party-planning rule of never auditioning new recipes on dinner guests did not bite me in the tush afterall. Having such fine and well-tested resources as Leite’s Culinaria and Cook’s Illustrated, of course, helped too. Recipe the first was for shrimp cocktail. Seeing as my husband loves cocktail sauce almost as much as he likes pickles – “I would eat anything dipped in it,” he says with not a hint of joking – when I saw that the America’s Test Kitchen Cookbook had a sinfully easy recipe for it, I couldn’t resist. 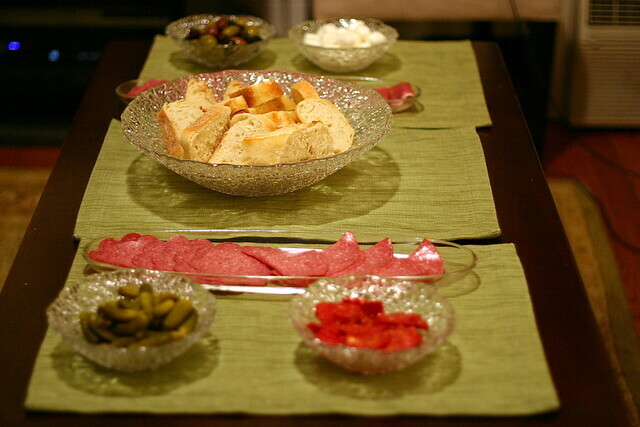 Appetizers should always be as simple as opening a few bottles and mixing with a spoon. As for the accompanying herb-poached shrimp, I can’t say with any certainty that the flavors of the stock get imparted in the shrimp. I’d probably just splash the wine, lemon and maybe a garlic clove in the water next time, saving a step or two. And also? We got such a giggle out of the specification of four peppercorns, and even more out of the scandalous act of tossing in seven, and not five, coriander seeds. We’re all rebel yell, aren’t we? 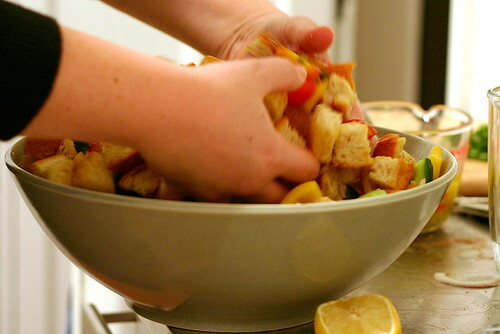 The second dish was a mixed-vegetable panzanella salad from Ina Garten. In my defense, I wasn’t even looking for a recipe from her, for once, but when comparing panzanella recipes online, hers called to me. (My favorites, however, will always be my roasted tomato white bean salad and Sam’s artichoke ga-ga-good ones.) It was a cinch to make, brightly-colored, flavored and textured. To prepare it ahead of time, I had all the veggies in one bowl, the croutons in another and the vinaigrette in a third, so they’d be ready when we were. Third, but not last, was the aforementioned gratin. Now, if your friends are anything like mine, you probably know that (almost) everyone arrives late, and you don’t eat for hours, which means things can easily get overbaked. This gratin, however, just said “thank you” – its extra hour or two at a lowered temperature only made it less sloshy and overly intense and more gorgeously crusted and rich. For my first gratin ever, I was exceedingly pleased, and am certain I need to look no further for more recipes. My only pause was that the flavor of the artichokes, as I had worried, didn’t stand up against the cheese, cream and potatoes. Artichokes are delicate flowers; they don’t like all this brouhaha upstaging them. Considering the high cost and great labor involved in dismantling six large artichokes, I’ll probably skip them next time, or opt just to eat them al directly, something it took great restraint not to, anyhow. I might, however, instead mince in some sharply-flavored cepe or porcini mushrooms. They’re not afraid of no stinky cheese. I’m all cashed out, so tune in tomorrow for dessert, yet another for the 28-day habit files. 1. Bring reserved shells, 3 cups water and salt to boil in medium saucepan over medium-high head; reduced heat to low; cover, and simmer until fragrant, about 20 minutes. Strain stock through sieve, pressing on shells to extract all liquid. 2. Bring stock and remaining ingredients except shrimp to boil in 3- or 4-quart saucepan over high heat; boil 2 minutes. Turn off heat and stir in shrimp; cover and let stand until firm and pink, 8 to 10 minutes. Drain shrimp, reserving stock for another use. Plunge shrimp into ice water to stop coking, then draining again. Serve shrimp chilled with cocktail sauce. Stir all ingredients together in a small bowl; adjust seasonings as necessary. 2. For the vinaigrette, whisk together the ingredients. 3. In a large bowl, mix the tomatoes, cucumber, red pepper, yellow pepper, red onion, basil, and capers. Add the bread cubes and toss with the vinaigrette. Season liberally with salt and pepper. 4. Serve immediately, or allow the salad to sit for about half an hour for the flavors to blend. I doubled this recipe and fit it in a 9×13 baking dish. 2. Slice the artichoke hearts 1/8 inch thick, and blanch in the lemon water until tender, about 5 minutes. After they are cooked, shock the slices in an ice bath and drain. Combine the cream garlic, salt, and pepper in a saucepan. Bring to a simmer and let reduce slightly. Peel the potatoes and slice 1/8 inch thick. To prevent discoloration, hold them in cold water until you are ready to use. 3. Preheat the oven to 350°F (180°C). Brush a 5-by-8-inch loaf pan with olive oil. Drain the potatoes and layer 1/4 of them in the loaf pan. First setting aside about 3 tablespoons of the cheese, sprinkle 1/3 of the remainder over the potatoes. Put 1/3 of the artichokes on top of the cheese. Repeat layering the potatoes, cheese, and artichoke chokes, in that order, two more times. Cover with a final layer of potatoes and pour the cream mixture over everything. 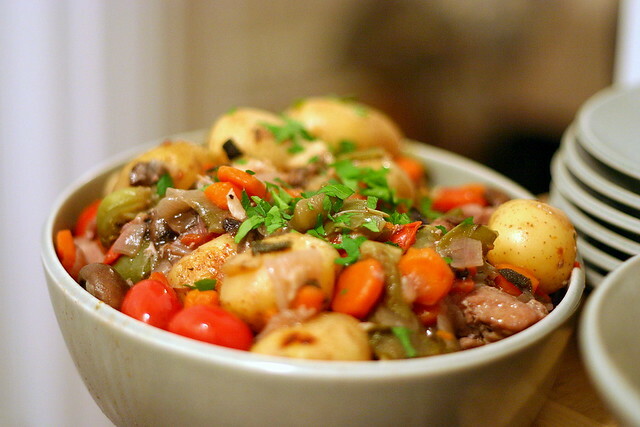 Cover the pan with foil and bake for 35 to 40 minutes or until the potatoes am tender. 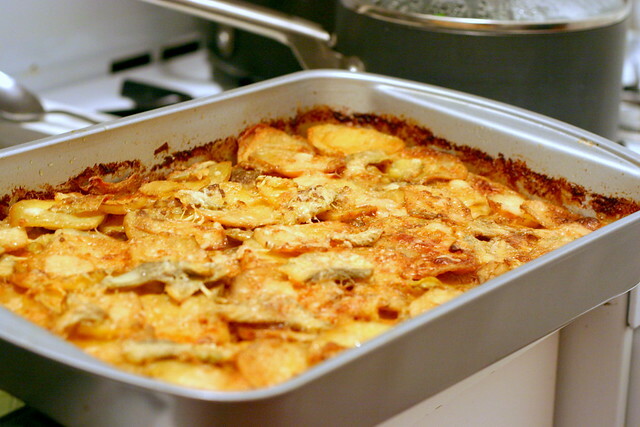 Remove the foil, sprinkle the gratin with the 3 tablespoons cheese that you set aside earlier, and return the gratin to the oven for another 5 minutes or until the cheese has browned. 4. After you take the gratin out of the oven, let it rest for 10 to 15 minutes before cutting. Run a knife around the sides of the pan to loosen the gratin, cut it into four servings, and remove the slices with a spatula. so glad to hear the night was a success although i am positive i shouldn’t have read this before i depart home to make dinner – nothing will live up to what my body and mind want after reading that. it’s just that i am far too lazy this evening to do anything spectacular! there’s always tomorrow! Mmm, gratin! I think I’m going to try out your Mac & Cheese recipe tonight. It’s cold and blustery in Wisconsin today …have to cook the warm comfort food before it (supposedly) warms up to 60 tomorrow (Yikes!). PS- I just asked in your last post what NaBloPoMo meant…I’m dying to know, really. this is where I head over to the dining hall, already dismayed, knowing the food choices will be something like “chopped beef steak” leftover from lunch and will NEVER even live up to the pictures of any meal you have ever prepared. … sigh. oooh this looks so fun! i love dinner parties. i host mine via smitten kitchen recommendations alone. i can’t find the haluski recipe right now, but when i do, i’ll send it to you. i do have my mom’s macaroni and cheese recipe. it is the best macaroni and cheese ever due to the onion flavor and simplicity of it all. your macaroni and cheese that you made a few weeks ago made me drool but it had too many ingredients that would spoil in a single girl’s refrigerator. maybe you can find a way to make this more rich or even more deilicious. add 1/2 # shredded sharp (white- it just isn’t right with yellow) cheese, small onion chopped and sauteed in butter, and the rue from above. put in a well buttered casserole and bake for at least 40 minutes at 350. i usually bake mine until it has a golden, crispy top. growing up we always faught over the “crunchies”. so, there it is- it’s very good and never fails- except when you try to health it up. Bawdy- good suggestion on adding the white sharp cheddar, that sounds awesome. I’m also wondering if I can swap sour cream for the cottage cheese, though as my boyfriend can attest, I, too, do not exactly possess good judgement when it comes to making changes to recipes. I have learned to follow them to the letter (*hangs her head in shame*). Hi! My name is Jen and I’m foodie. Deb, you are the reason I’ve had to buy several new keyboards in the last few months…they don’t do well with drool. Also, my boyfriend (again) sends his thanks for the recipes. He won’t starve anytime soon. Megan, it’s National Blog Posting Month. Bloggers are supposed to post at least once a day for the entire month of November. Everything looks great! Despite your renegade extra coriander seeds! I think a chair-warming party is a great idea, especially with all of the waililng and gnashing of teeth usually involved with buying furniture. P.S. I think we may have the same placemats. Crate and Barrel? I was looking at the Flkr photos, noticed the 1 titled “DUDE”…made me giggle.. I do however buy a hunk of smoked gouda, grate it and layer it between the potatoes.. since the potatoes are mixed colors the creatvity comes out and i “artfully” arrange the colors.. looks pretty… oh and i totally dont follow the cooking time.. it seems like it always needs more. That shrimp photograph is simply gorgeous. It sounds as though you had a great time. Good luck catching up on the sleep. It sounds like a great dinner, and glad the new recipes went well. Too many times I’ve tried out new recipes on unsuspecting people and it hasn’t worked out! Elle – Aww. Believe me, I had years of dorm food too. Blech. I used to get this taco salad mess of various fatty glopsÃ¢â‚¬Â¦ ecch, I don’t even want to talk about it. Bawdy – I totally beg to differ that our recipes have a differing number of ingredients, but that aside, yours looks great. Since I love onion in just about everything, I might have to try this! Megan – Ooh. I was totally thinking sour cream might swap well for cottage cheese, but haven’t tried it yet. Let me know what you think – I’m sure it won’t mess it up or anything. Jenifer – I am sure Alex would love Tabasco in his cocktail sauce, too, but would never give up that horseradish flavor. He’s obsessed. RA – Crate and Barrel placemats, though I hate them because they have to be ironed after a machine-washing which is just completely out of my range of domesticity. (I mean, if we’re paying for wash-and-fold, I expect to do no work.) Chairs are from the same. Cupcakes – Sounds delish, though personally I can’t handle smoked cheeses at all. TheyÃ¢â‚¬Â¦ I donÃ¢â‚¬â„¢t know, get overpowered and the flavor tastes artificial to me. But! I have a ton of friends who love it so thanks for the idea. Claire – Nah, she does this whole cooking-on-instinct thing so foreign to me. I know she started with a Cook’s Illustrated recipe and lots and lots of chicken thighs. And that the leftovers made for a delicious dinner last night. Brilynn – I think I just got lucky, heh. For such a fancy recipe, it would help to use extra-virgin olive oil in place of normal olive oil. I’ve been using extra-virgin olive oil from Holy Food Imports (www.holyfoodimports.com) for most of my cooking, and every recipe I make, everyone loves it. Hi, I’m late to the party but have just found your site. I’m an artichoke aficionado and have found that if you cut those suckers in half, put 1/2″ water in the pan microwave covered for 5-8 minutes and *then* clean the leaves and choke out, it’s immeasurably easier to use artichokes in recipes. If you can find them, get the baby artichokes, the smaller the better. You can eat the whole thing and not worry about any undigestable bits. I use them with eggs, crab/lobster, chicken stir fry, anything with ricotta or Parmesan cheese and many other ingredients. I’m a “what’s in the fridge” kinda gal and don’t really follow recipes but try to find complimentary ingredients. It’s a lot of fun. I love this site, you’ve used a lot of stuff together that I haven’t tried yet but will! yeah…saw that after i jotted off my YOU MUST TRY THIS. It IS so delicious (isn’t it? Like, REALLY? ), but I, too, was dismayed (okay, downright grumpy) by the additional steps/superflous dish-dirtying and DID roast the Brusells sprouts on the same tray before the squash (wasn’t sure if one would take longer than the other). I think I used the same sheet to toast the croutons as well (and if I didn’t, well, that was just silly). I think I’m going to make this in place of stuffing this year for our small Thanksgiving celebration. It’s a terrific dish to bring along and toss together at a dinner party, too. Because WHO in their right mind doesn’t like eating BREAD and calling it a SALAD (Like a Real Man of Genius). Hi! New devotee here! Your blog is the very best food blog I’ve ever read. Just made your shrimp cocktail, tried a shrimp, then went back and read how you didn’t think the broth imparted much flavor. I definitely agree, but I think the stock, which I froze, will come in handy in the future. (Also, I dumped all of the ingredients in with the shells to simmer, and it still didn’t taste too exciting. But the shrimp are still great, and so is the cocktail sauce.) Thanks very much for everything you do! Made the artichoke potato gratin dish last night for holiday night with the girls. Doubled the recipe. Used two bags of fingerling potatoes. Needed to bake about an hour. Every single woman asked for the recipe! Could you please animate this so they do wriggle? seems like the link to the roasted tomato white bean salad is broken– i’m off to search in the archives, but just wanted to give you a head’s up! s — Whoops. Here it is. Link now fixed, thank you. I tried this on friends tonight (good friends), and while it was good, the pan size and the cooking time were way off (for me). Firstly, I could not get HALF the potatoes in loaf pan. (I made baked chips out of some of the rest.) I had taken another pan along (to a friend’s house), but with such an excess of potatoes, did not want to stretch the prepared cream that far. Secondly, I triple-checked the temperature. The potatoes were still quite firm after 35, and 45, minutes. After an hour, the rest of dinner was getting ready, so I removed the foil and added the rest of the Asiago. It did not brown. I left it in another 20? minutes, and the rest of dinner was ready, so I turned the broiler on. It did make a lovely chewy top. Overall, I think I had the dish in for an hour and a half. If I try it again, I will use the large (9 x 13) pan, and probably double the cream but not the potatoes. And cook hotter. BTW, I used my mandoline to slice the potatoes, and they were not even 1/8″ thick. Fortunately, these were good enough friends that they appreciated the flavor; it just took much, much longer than expected. Oh, and I was glad I was at someone else’s house, because my broiler is a drawer underneath the (gas) oven, and a loaf pan probably wouldn’t have fit in there. 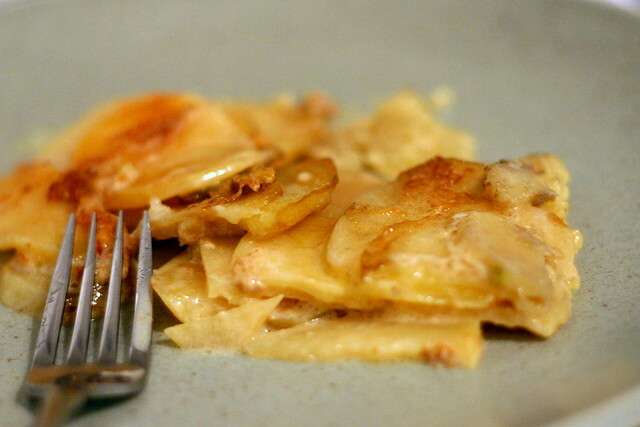 I love the artichoke potato gratin and have made it for Christmas dinner the past couple of years. I wanted to try to make it ahead of time (tonight! )…is there a good stopping point? You can assemble it days early, even, and bake it when needed. Or you can bake it, you know, 3/4 of the way and finish it off before serving. Gratins generally reheat well too but if I’m making it specifically to serve a couple days later, I usually shave 5 to 10 minutes off the cooking time so it doesn’t get too dark. Hey Deb! Longtime reader and LOVE everything you do on this site! I haven’t been disappointed by a single recipe I’ve made, and you are always my go-to for new things to try! I was wondering if I could cook the shrimp a day ahead of time and keep them in the fridge? I’m hosting a family dinner on Sunday so I wanted to prep as much as I could on Saturday. Thank you! Yes, but of course, not much longer. Freshly cooked shrimp taste the best.